Honda Civic Tourer pictures | What Car? 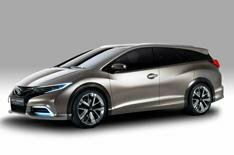 This is the new Honda Civic Tourer an estate version of the Ford Focus and Volkswagen Golf rival that's has just been revealed as a concept car at the Geneva motor show. The new model is recognisable from its doors forwards, but the higher, longer roofline helps to make the Civic's side detailing look less fussy, particularly around the rear wheelarches. Honda hasn't revealed any dimensions for the car, although it does make claims of 'class-leading space'. There is a fairly pronounced angle to the rear hatch, which could improve aerodynamics and improve fuel economy but also eat into the car's load space. The engine line-up for the new estate is likely to stick closely to that of the hatchback, including at least one version of the new 1.6-litre turbodiesel engine. The final production version of the Honda Civic Tourer is expected to be revealed in the autumn, and order books should open before the end of this year.